Since it’s creation 4 years ago, during the winter months, the Bracket Super Tour open his membership registration process to the racers that wants to run for the national championship. A couple of new things this year. Two champions will be crowned in the Super Pro category. One champ on the Door Car side and one on the Dragster side! Both champions will take home 3,000$ and their national champion trophy. The racer with the most points will also get a free entry to one of the 2020 SFG Promotions big money bracket race. The Top Sportsman category is also added to the menu in 2019. 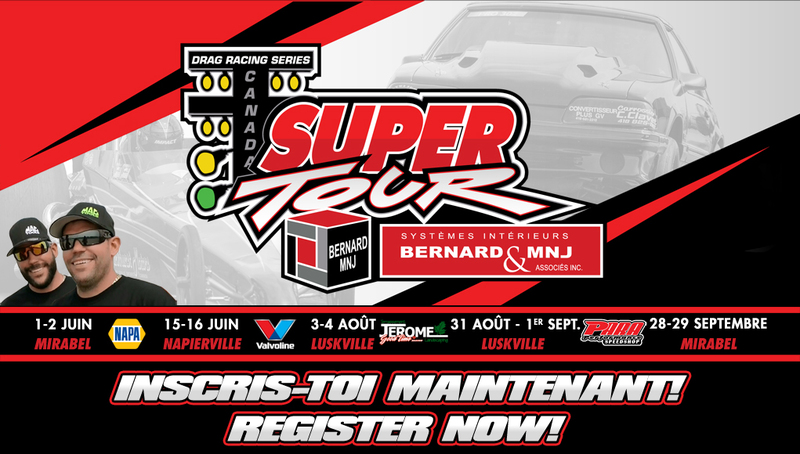 The fastest door car bracket class will be featured at select events in Mirabel and Napierville. Entrys and Payouts are not fixed yet but will be posted soon. No championship will be put on for this class though. This year, all 10 races will count for the National Championships in both Super Pro and Pro class. The champions will be crowned virtually on the internet and championship payouts will be mailed. The complete 2019 Bracket Super Tour flyer will be posted in a couple of days on social medias.